Several successful attempts were made in Italy as well as Britain for the production of gliders for operation on water, but were generally designed for calmer waters of inland lakes or close inshore. It had been observed for some time that Cumulus high lift clouds formed offshore and this lead to the idea of building an amphibious glider to experiment with such conditions, but to operate in more severe water environment than had previously been attempted. It fell to the DFS designer Hans Jacobs to take on this challenge and it would finally be built at Poppenhausen. 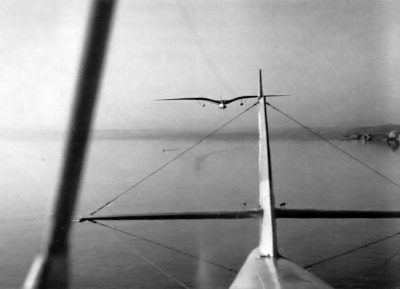 Following results from the flying boats, the glider would need a strong broad hull to help keep it level in the water, but this was contrary to the requirements of a performance glider which needed low drag from a narrow fuselage. A compromise was reached whereby the hull width was able to be reduced by employing large volume (80 litre) floats positioned close in to the fuselage suspended on streamlined tubing. These floats were designed to supply a certain amount of dynamic lift once airborne. All this ran contrary to other amphibians which generally used small volume floats positioned towards the wing tips. 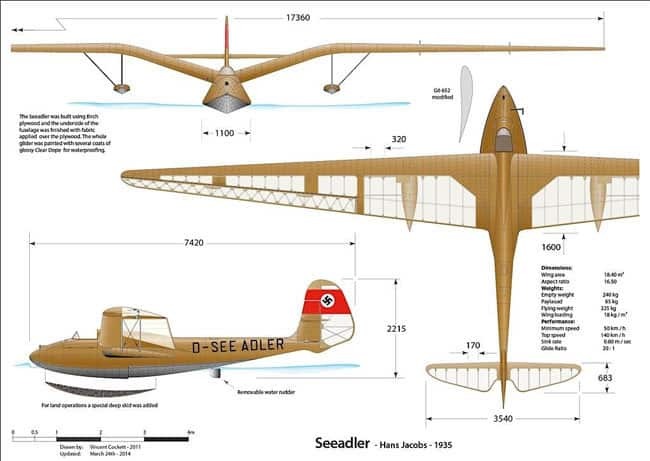 The wide “Seeadler” floats, in combination with the fuselage, effectively increased the central footprint thereby improving the gliders stability on the water. Separation from the water when towing for take-off was aided by the means of a stepped hull. A removable water rudder, coupled to the main rudder, was fixed below the fuselage and proved to be very effective at low speeds up to 15 to 20 km/h.The underside of the fuselage was covered with a heavy cloth, fixed with adhesive and painted with multiple layers of dope. The wings would be very vulnerable to any wave action and to overcome this they needed to be held high, achieved by the use of a gull wing. The inner panels had to be very steep to accommodate the floats which were mounted at the gull break. Jacobs decided to adopt the proven wing from the “Rhön Adler” and modify it to suit the “Seeadler”. The wing- nose was in single bulkheads and watertight to provide the greatest possible buoyancy in any crash. The cockpit was enclosed by a split wood canopy and left open so that if water sprayed over the windshield, a good view could still be seen to the side. Easy evacuation was also another design factor. The glider was conceived for mixed operations whereby the floats could be easily removed and a skid attached below the fuselage for normal land operations. For flying from a slope, the glider could use the skid for take off, but with floats attached could glide to a lake or river for landing. 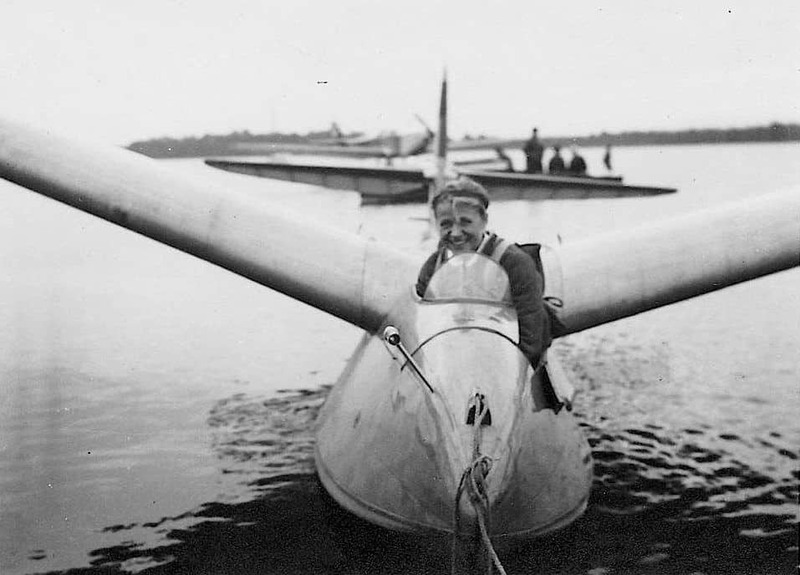 The maiden land-based flight took place at Darmstadt in the summer of 1935, piloted throughout by Hanna Reitsch, when it was found that no significant loss of performance was caused by the steep gull angle of the inner wings and overall general performance was quite acceptable. 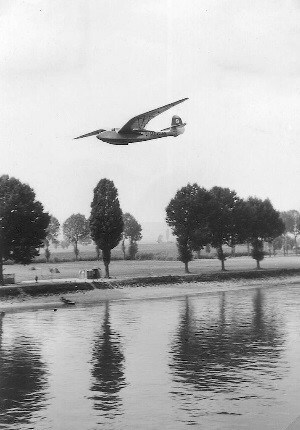 Later that year in September, water trials were carried out on a busy waterway but was proved unsuitable as, like a runway, there were only two possible landing directions. For this reason the trials moved to the more accommodating Lake Chiem, Bavaria. A racing speed boat was initially used to launch the glider, but it was only able to reach around 40 km/h., whereas it needed to reach 58 km/h to succeed. 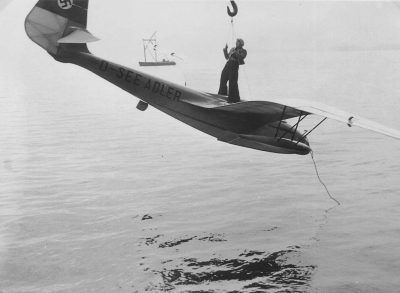 One of the problems was the extra weight and drag caused by the long waterlogged tow rope, which sank down deep due to its own weight, causing the “Seeadler” to dive down when launching. Balsa blocks were added as floats to the line and the rope shortened, but still there was insufficient speed. The crew gave up with the tests after only proving the glider was waterproof. Trials resumed in November 1935 on Lake Constance, but this time using a more powerful Maybach speedboat. Tests were carried out by reducing further the rope length and using a smaller diameter tow-rope. The speedboat finally reached the magical speed of 58 km/h, but was only able to carry out an airborne tow across the lake, restricted by the short length of the rope. It finally came down to a Dornier Do12 “Libelle” flying boat to finally pull the glider off the water. A bonus was the smooth surface of water in the wake of the flying boat. Testing continued through various weather conditions with satisfactory results, but the “Seeadler” was only ever to be used in the Summer of 1938 by the sand dunes of Rossitten and was aero towed behind a Klemm L26c motor glider. 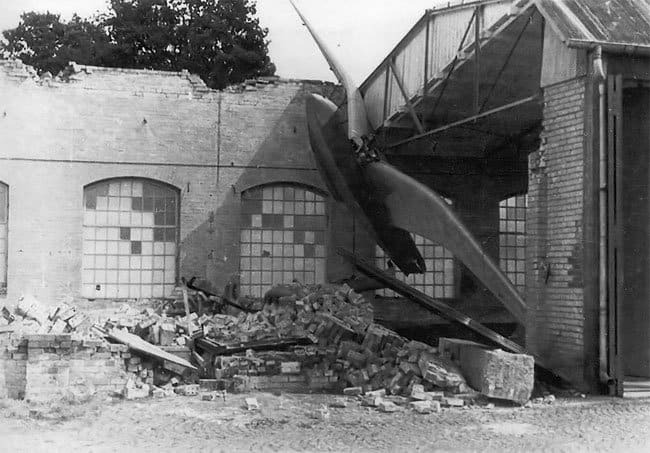 The “Seeadler” was stowed in a hangar during the war and was destroyed by allied bombing. 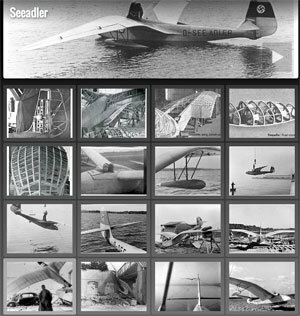 I was called upon, in the summer of 1935, to test the “See Adler,” the first glider seaplane designed by Hans Jacobs. 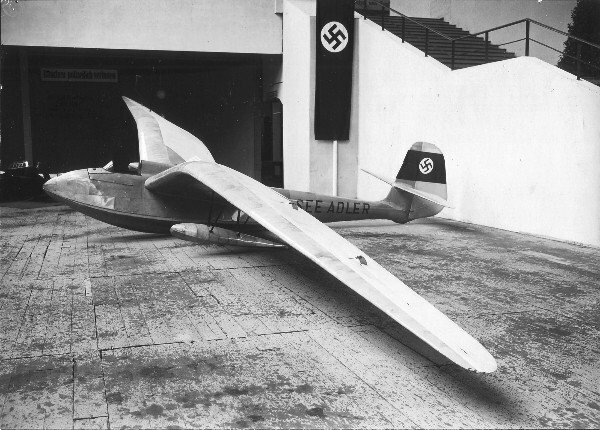 Though the idea of an amphibian glider was not new, the “See Adler” represented the first attempt to construct a high performance plane of this type, for use, principally, in scientific research expeditions. The first test, carried out on the Chiemsee, south-east of Munich, was aborted, the motor-boat which had been procured to act as tow being unable to reach the take-off speed. We then transferred to the Bodensee, where the Maybach speed-boat, which Dornier placed at our disposal, proved adequate for the task. That may sound simple but in reality, the problem of the take-off proved both difficult and dangerous We used, at first, a three hundred foot tow-rope, but its weight and resistance in the water were so great that, when I took off and rose to a height of about thirty feet, the rope dragged me down again sharply and I quickly cast off for fear I would strike the water and break up. Watching from the boat, my friends, however, were of the opinion that I should have held on and so I tried a second time, doing as they suggested until there came a sudden jar, a sheet of water swept up over the plane and together we dived below like a submarine—to surface again, a few seconds later, completely unharmed. Though this experience supplied conclusive evidence of the solidity of the machines construction, my friends were unanimous in considering it unsatisfactory as a permanent method of taking off. The tow-rope was now shortened to 230 feet and provided with small, stream-lined floats made of balsa wood In this way, I could take off in the “See Adler” without immediately being dragged down again. This device proved practicable, even to the limit of the weather conditions which the speedboat could tolerate. Thereafter, we continued the tests, using a Dornier amphibian flying-boat, the “Libelle” (Dragon-Fly) as tow. This was lent to us, together with a pilot, by the well-known aircraft manufacturing firm. The pilot, Sepp Gertis, proved to be excellent at the task of towing, particularly when we were determining the worst weather conditions in which he could operate the “Libelle” an undertaking which he carried out with an admirable mixture of caution and cold-blooded daring. As for me, I found it a great advantage that the slipstream of the amphibians airscrew left a comparatively calm strip of water in the wake of the plane on which I could hold the “See Adler” with ease, even in wind conditions which forced the towing plane to battle against the waves. The take-off when on tow behind the Dornier amphibian proved equally straightforward. I allowed myself to be towed to a considerable height before casting off. The weather forecast predicted a storm and the clouds were already gathering in the sky But this was the very weather we had hoped for, so that we could test the behaviour of the “See Adler” when landing on rough water Every kind of lifesaving device stood ready for my use on shore, though my thoughts did not lie, at the moment, in that direction. First, I searched round for a cloud which would ensure me a thermal. I soared up, struggling continually against the approaching storm, so as not to be driven too far from my landing target. Below me, the foam crests of the waves were steadily increasing and all boats had long ago returned for shelter to the shore. I must have been soaring for a good hour before I came down to land The “See Adler” had a hull like a boat and, at a landing-speed of barely 35 mph, I touched her gently down on the water. Immediately, the waves began to throw the plane about as they rolled up, peak upon trough, in an endless succession. But the plane rode them out, placid and unruffled by the fury of the elements. No boats were able to put out to fetch us and for such occasions, the aircraft hangars which stood at the waters edge were fitted with cranes. I found that the only way to fasten the hook of the crane on to the aircraft was for me to stand on one of the wings in order to help keep her on an even keel. But all went well and the “See Adler” was hoisted in without damage. The plane had certainly withstood its baptism and with that, our task was completed. From the Bodensee, we then returned to the Chiemsee to test a new catapult launching device This, the so-called Madelung catapult, was intended to enable heavily laden transport planes to take off in a small space instead of from the immensely long runway that was normally required The catapult had already been tested on land and it was now a matter of establishing whether it would prove equally useful for a water take-off For these tests, the “Sea Adler” was considered a suitable plane. The catapult was set up on the shores of the lake. It essentially consisted of a device to transfer to the aircraft the energy of a rotating fly-wheel by means of a steel rope led over a cone-shaped drum. As the rope was taken up by the drum at an increasing speed, it snatched me and my glider directly towards the scaffolding of the catapult erected on shore. The feeling was distinctly unpleasant. The crux of the matter was to wait for precisely the right moment at which to drop the tow, then to perform a neat and rapid turn and land again on the water. As in so many tests, this task called for the greatest care and concentration if disaster was to be avoided. The trials were successfully concluded, so paving the way for further tests with powered aircraft.